The winter months are coming to an end here in Hawaii and its time for us to wrap up another Hawaii Winter Outlaw Series season. We kicked it off over in the lava fields on the Big Island where Zach Newman took home the win. Next up we gathered on the slopes of Haleakala for the Maui Challenge, California's Byron Essert took out all the Hawaiian's for the win. To finish off the series we will be having our 8th annual Festival of Sugar and Love weekend! The festival is going down on February 20 and 21. Saturday the 20th we will be gathering at the loop for the F.O.S.A.L freeride… no competing this year, no judging, just pure fun with friends on some of the best wheel sugaring terrain on Oahu. Steep, back to back hairpins on perfect pavement with one way downhill traffic. We will be gathering at noon and shredding till the sun goes down! Once the sun sets, camping up at the loop is available once again for all riders who want to keep the festival going throughout the night. IF you plan on camping, remember to bring sleeping arrangements and food for the night. Also send your Hawaii ID # to StokedSkaters@aol.com as soon as possible. After a night of festivities we will be waking up the next day and heading out to the North Shore for some fun, fast racing. We will be returning to the same race course as last year which has proven to be an intense one. Consisting of FAST dips and sweepers along with some ripples that add some fun…. 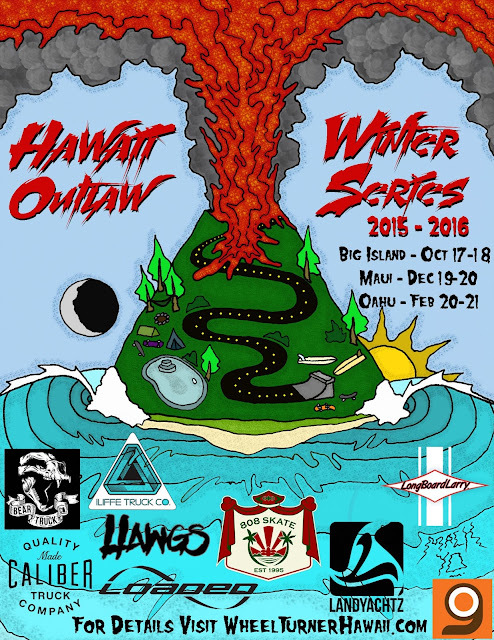 this is going to be an action packed race to determine our 2015 - 2016 Hawaii Winter Outlaw Series champion. The F.O.S.A.L freeride will be FREE to jam this year… just bring food to throw on the BBQ. $15 to race on Sunday. At the land of the Peacocks. Meet at the beach across from the course at 1130am. HELMETS AND GLOVES ARE REQUIRED TO COMPETE IN ALL EVENTS. We will see everyone at Noon @ the loop on the 20th!